If you are uncomfortable working with suicidal patients, you are not alone. Research shows that the vast majority of clinicians fear the suicidal patient. Therapist fear of patients is never a good thing in the healing arts, and distancing oneself from a patient expressing suicidal desire is not uncommon, and may even lead to increased suicide risk among those served. Yet suicidal patients are not rare. In some settings, "suicidality" is the ticket of admission for both inpatient and outpatient care. Research on this topic is underway. Around the world today more than 2,500 people will kill themselves. The World Health Organization estimates that as many as one million people may die by suicide each year, and that many millions more attempt suicide each year. Most of these people will never have had an opportunity to benefit from what you can learn in this course. If you are a mental health professional, substance abuse counselor, psychiatric nurse, school, correctional, church counselor or anyone with professional training who is in a position to work with, counsel, and help suicidal people survive a life-threatening crisis, this book-based study program could prove very valuable. 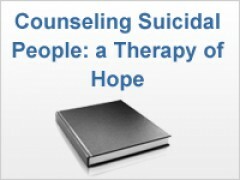 This online training program is based on Counseling Suicidal People: A Therapy of Hope written by the course author. This is the 3rd edition of this time-tested, condensed, easy-to-read work of just 213 pages. Additional files, notes on how to cope with suicide events in the counselor's practice, short lecture videos, audio files, author commentary, and other materials enrich the basic text. The question for those working in the field of human services – from probation officers to pastoral counselors to psychotherapists – is not whether you will meet a suicidal client, but when? The next question is: Are you prepared for this always challenging encounter? Having worked with hundreds of suicidal patients over more than four decades of practice, and having trained thousands of clinicians for the last 30 years, and having kept up with the scientific literature on suicide and its prevention, I believe I can help you meet that suicidal client with a sense of self-efficacy, calm and confidence. I cannot stress how important this calm and confidence about working with suicidal people will be for you, but I can stress - from the client's point of view - how important these qualities are to people considering suicide. Speaking for clients everywhere, I can think of nothing more frightening or hope destroying than to meet with an uninformed, uncomfortable counselor so terrified of suicide that he or she can't even broach the subject. Yet research shows this is exactly what happens every day in doctor's offices, counselors offices, emergency rooms, and a thousand other settings all across America and around the world. Following developing social policy recommendations on suicide prevention training, a White Paper on the failures of our training institutions to prepare helpers for their professions is to be published by the American Association of Suicidology in late 2011 or 2012. This paper will - we authors hope - stir action to enhance client safety by requiring the kind of training contained in this course. A link to this paper will be available on the QPR Institute web site when it is published. In the meantime, you don't have to be a counselor that confirms the suicidal client's worst fear - "My God, they can't even talk about it!" Rather, you can become someone who saves lives. Where surgeons save lives with scalpels and stitches, counselors save them with words and empathy. If employed by, or volunteering for, an organization, participants agree to accept all expectations and employment rules of their parent organization. The QPR Institute does not vet or otherwise qualify students for this course, nor does completing this training program attest to the specific counseling competencies of the learner. Note: this training program teaches initial and basic suicide risk assessment skills. Advanced suicide risk assessment training and documentation skills for healthcare professionals are available from the QPR Institute in a course entitled: QPRT Suicide Risk Assessment and Risk Management Training. The author has selected dozens of specific counseling interventions which can be picked up from this course and added to the counselor's tool box. Some of these techniques and strategies will be immediately useful with both suicidal and non-suicidal clients. These interventions are based on supporting science and the author's more than 40 years of clinical experience as a psychotherapist specializing in treating suicidal clients. Strategies include everything from diet, exercise, deep breathing, Cognitive Behavioral Therapy techniques, family interventions,bibliotherapy, and empowerment moves, as well how to use self-disclosure, reduce shame and fear, and generate new reasons to live for those who are thinking about suicide. The vast majority of these interventions are low-cost, easy-to-use, and non-medical counseling solutions that do not require extensive training or certification. "This work eloquently captures the essence of the most sophisticated interventions, that of the healing relationship of hope." - Dr. Ronald Bonner, Journal of Suicide and Life-Threatening Behavior. "Paul Quinnett has done it again. In his plain-spoken yet compassionate style, he communicates sound strategies for connecting with and helping suicidal individuals. Counseling Suicidal People deserves a place on the desk of every crisis worker and therapist who works with suicidal individuals. I will assign it to our psychology interns and psychiatry residents." - Thomas E. Ellis, Psy.D. ABPP, Professor of Psychology, West Virginia University School of Medicine. Large employers may inquire about discounted unlimited use licenses for our bundled institutional courses (3 year minimum contract is required).